Home Health Aides Could Lose Out If Medicaid Changes : Shots - Health News Many health care aides were able to get insurance through the Affordable Care Act. But with the law's future uncertain, they don't know how their jobs or their doctor bills will be affected. 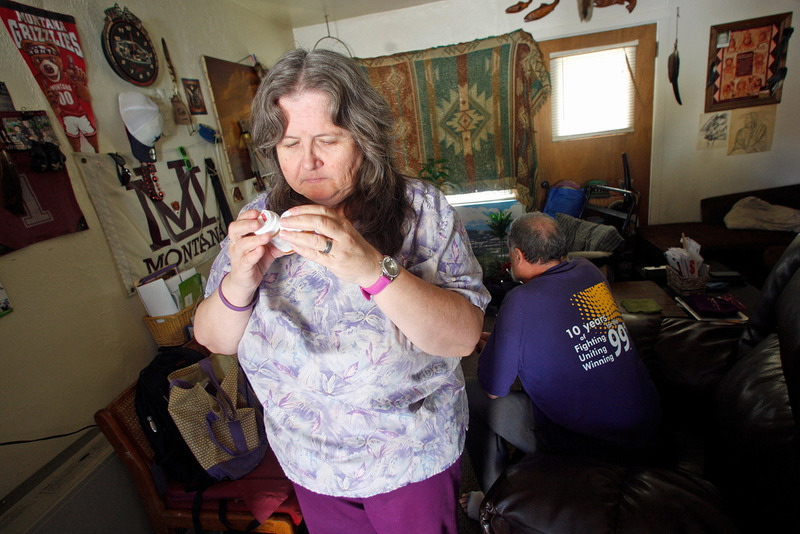 Celeste Thompson, 57, a home care worker in Missoula, Mont., examines a pill bottle in her home. Thompson cares for her husband, and worries that if she loses her Medicaid coverage she won't be able to afford to see a doctor. For more than two decades, Celeste Thompson, 57, a home care worker in Missoula, Mont., had not had regular contact with a doctor — no annual physicals and limited sick visits. She also needed new glasses. Like many others who work in the lower rungs of the health care system, a category that includes nursing aides as well as direct care and personal care assistants, she has worked hard to keep her clients healthy by feeding them, dressing them and helping them navigate chronic conditions. Workers like Thompson often don't have health insurance. Many home health agencies, 80 percent of which are for-profit, don't offer coverage, or their employees don't consistently clock enough hours to be eligible. The average annual salary for home health workers is $20,000 a year. Industry revenues approach $100 billion annually and are projected to grow. "It's a social justice issue. We have a workforce that is the backbone of long-term [care] services, and they themselves don't have coverage," says Caitlin Connolly, who runs a campaign to increase home care wages at the National Employment Law Project, an advocacy organization. That all changed for Thompson in 2015, when Montana opted in to the Affordable Care Act's expansion of Medicaid, the state-federal low-income health insurance program. Thompson, who was making about $10 an hour, immediately signed up. Vision care was among the first things she focused on. She had not visited an eye doctor in nine years — a problem because her job includes keeping track of patients' pill bottles and making sure they take the right medications. "I had to use a magnifying glass to see small print," says Thompson, who now wears bifocals. Her doctor has warned her she may need a stronger correction soon. The Trump administration's attempt at replacing the Affordable Care Act would have reined in Medicaid spending in states like Montana. But the bill failed to get enough support in Congress and was withdrawn March 24. Many Republicans say repeal is still a priority, and Health and Human Services Secretary Tom Price could change key regulations affecting the current law right now, without Congress. The lack of clarity means that Thompson and many other home-based caregivers don't know what's going to happen to their insurance coverage. From 2010 to 2014, about half a million of these workers gained new health insurance through the Affordable Care Act, estimates PHI, a New York-based nonprofit that researches this slice of the labor force and advocates for improved working conditions, in a March issue brief. Most home care workers' gains came from living in states that, like Montana, expanded Medicaid. But even with Obamacare in place, many home health workers — perhaps 1 in 5 — remain uninsured. By contrast, about 8.6 percent of all Americans lack coverage. Before Thompson got Medicaid, a sinus infection represented an unplanned expense. Seeing a doctor meant forgoing groceries. She would take over-the-counter pills and hope to get better. "I would go to work sick, and that's not good," she says, noting that her clients are frail and elderly. "But I couldn't afford to be off. I needed the money." Many Republicans have long favored proposals to reduce federal costs associated with this state-federal low-income insurance program, saying that shifting funding from a per capita basis to block grants to states would make the system more efficient. But many advocates for these workers take a different view, and the current air of uncertainty adds an extra layer of concern. Under the 2010 law, "at least we were on a path" to addressing coverage and access concerns, says Elly Kugler, the federal policy director at the National Domestic Workers Alliance, a coalition that represents home care providers. If it goes away, she said, it's not so clear how these workers will access health care. The federal government only recently ruled that home care workers qualify for overtime pay and minimum wage protections. And there's another rub: Most of the money paying for long-term home care comes from Medicaid and Medicare, PHI estimates. If either of those sources is squeezed, that will mean fewer people receiving home health care, and "that will translate to hours cut," Connolly said. "My clients won't be able to afford me. I can't make a living. It's a vicious cycle," says Kim Thomas, 52, a home care worker in Durham, N.C. She makes $9.75 an hour and has 32 clients — one of whom is almost fully paralyzed and needs help eating, dressing and moving. Her days start at 5:30 a.m. To make ends meet, she works nights at the local hospital. Thomas is diabetic. For Thompson in Montana, the concern is similar. If Medicaid is revised or the health law repealed, she said, it's not just her insurance at risk but her livelihood. Her medical history puts her at high risk of endometrial cancer, and her doctor recommends screenings twice a year. But without insurance that's not feasible, she says. "We don't have enough money at the end of the month to buy essential things, like deodorant," she says. "We go to the food bank four times a month. Without Medicaid, it would be really hard on [our family], trying to come up with the money to go the doctor."